This year we embarked on a major rebranding project for Wheelhouse Home Services, our exterior detailing business. The idea of rebranding made a lot of sense to the entire team. Our previous name was created by Reed Ferris and Connor Mack, who are seasonal employees for Holiday Spirit Lighting (our sister business), and we thought a fresh start for branding and offering a more defined list of services was the perfect way to attract attention for the business. So a new name seemed like the next logical step. But this also meant we would need a new logo and new color pallet for business. Not to mention we still needed a clean, modern website to attract customers and to better advertise our services. All of this was definitely a lot to have on the plate. We were definitely excited but knew that there was lots of work to be done. For the rebrand, we contracted a few very talented individuals to assist with our branding, naming, and marketing efforts. Steve Ruttner, from AdVisions Marketing and Graphic Services, is working with us on developing a new name, logo, color pallet and some physical marketing materials. John Thompson, John Thompson Designs, is currently working on our brand new website which already is coming along very nice. It has the exact look and feel we want our brand to be known for. Andrew Steagall, MAS Media Productions, is a photographer who has helped take photos for our website and other social media sites (check us out on Facebook, Instagram, and LinkedIN). Overall it has been excellent working with Steve, John, and Andrew. They have all done a great job and have helped create a our brand identity. Brett and I have done our best to convey the type of business we are, the type of clients we reach, and the type of story we want to tell about our business. Steve, John, and Andrew have listened and helped us come up with some marketing and branding materials that we can’t wait to reveal in early March of 2018. After a few rounds of name choices, we settled on Renova Exterior detailing. Renova is a latin word that means ‘to renew, revive or restore’. It was the overwhelming favorite by our Management team and also our Holiday Spirit Lighting employees. We loved the fact that it was a bit obscure and unique but also had a nice ring to it. We also enjoyed that the word ‘renova’ describes exactly what we do. 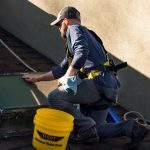 We bring your home or business back to life with a variety of different exterior detailing options for both commercial and residential clients (Window Washing, Pressure Washing, Gutter Cleaning, Roof Cleaning/Moss Removal, and Solar Panel cleaning). After the name was selected we settled on a color palette consisting mostly of a bright sea blue, bright green, and accents of yellow. Being a Seattle owned and operated business, we wanted our company colors to reflect the beautiful scenic place we call home. The bright blue skies and fresh-water, the lush greenery, and a the yellow sun to really tie it all together. Not to mention local sports like the Seattle Mariners, Seattle Seahawks, Seattle Sounders, and the Seattle SuperSonics (RIP) all use some variety of blue and green. We love all things about the Pacific Northwest and these colors best represent the region and our business as well. Once we had the name and color pallet finalized, the last piece of the puzzle was the logo. Big shout out to Steve Ruttner for the work he did with the new name, colors, and logo! I highly recommend using Steve for any Marketing or Graphic Service needs. Steve came up with a variety of different logos that we all loved. After further review, we decided to select the image below. It has a modern, clean look to it and we all loved the window and sunshine graphics on it. Renova Exterior Detailing will primarily focus on window washing and we loved the idea of having clear blue skies and a bright yellow sun in the logo. Nothing beats a lovely day in the Pacific Northwest and we knew this logo would definitely give off the right impression to new customers and repeat customers too. The whole rebrand process has been a lot of fun for the Renova Management team. We’ve got to work with some excellent marketing specialists, help clearly define our branding, and increase of marketing presence on the web. Check out the next blog post and newsletter for some more information on our business and other related content!